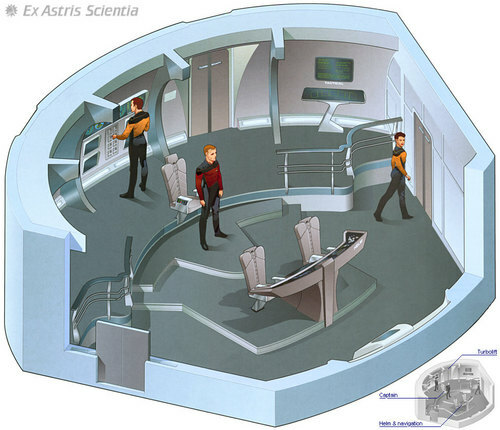 The battle bridge is an auxiliary control center, located in the secondary hull. The battle bridge duplicates the strategic functions of the main bridge, with command, conn, ops, and tactical stations oriented toward a main viewscreen; however it also lacks science and engineering stations. The main bridge and battle bridge are connected by a dedicated emergency turbolift The battle bridge can also be entered by standard turbolift or through the door via corridor on deck 7.A small captain's ready room is located on the port side of the bridge, although it is much smaller than the one off the main bridge and lacks a window. Also the battle bridge could potentially be used to control the entire docked ship in the event of damage to the main bridge.